It’s that time of year again: the next generation is headed back to school and their variety of before- and after-school activities. Parents, family and friends looking at upgrading their vehicles will have this in mind this time of year, so Steve Halloran, the chief editor at CarGurus, has announced his company’s recommendations for them to help ease their guesswork. Dealers can gain a few tips, as well. According to a recent online poll by CarGurus, 38 percent of car shoppers with school-aged kids said they spend between 30 minutes and one hour each day with kids in their car. A third said that time was stretched over an hour. When a customer comes onto the lot, it may be worthwhile to ask if kid-hauling is part of their regular activities. Here’s a list of vehicles that may be appealing to them, according to CarGurus. According to CarGurus, this list was compiled based on currently available models with a focus on safety records, cargo storage space, seating capacity and availability of technology features. For more information about CarGurus, visit its site here. Three other factors besides vehicle dependability triggered a 34-percent spike during the past 12 years in the average time for a new vehicle to enter the used market for the first time. According to the latest report from the Used Car Guide division of J.D. Power, that average time moved from 48.2 months in 2003 to 64.7 months in 2014. Analysts arrived at the metrics after reviewing IHS Automotive registration data. With those trends in mind, here are two key takeaways dealers, finance companies and other industry observers should digest. J.D. Power Power Information Network (PIN) data indicated that new vehicle length of ownership is “more or less” keeping pace with progressively stretched loan terms, report authors surmised. PIN data put installment contract terms year-to-date at an average of 67.3 months. “Certainly the trend toward longer loan terms isn’t without tangible risk,” analysts said. “For example, longer terms increase the time required to reach positive equity,” they continued. “But it’s much less likely the vehicle will suffer a significant operational failure before the loan is paid in full. “Consumers and lenders wouldn’t be as willing to take on the added risk if it were,” the report goes on to say. Further cementing the point about risk is this: Experian Automotive pointed out that average amount financed to complete a new-vehicle installment contract during the second quarter increased by $1,095 year-over-year to come in at $28,524. The other takeaway Used Car Guide wanted to leave with the industry is how all of these elements are combining to impact the consumer purchase cycle. “The longer the length of ownership, the more time has to pass before a consumer is back in the market for another new or pre-owned vehicle,” analysts said. Earlier this year when Experian Automotive only had Q1 data to share, analysts spotted that contracts with terms lasting 73 to 84 months accounted for a record-setting 29.5 percent of all new vehicles financed, marking an 18.6 percent rise above Q1 2014 and the highest percentage on record since Experian began publically tracking this data in 2006. In Q2, that level of 73 to 84 months contracts came in at 28.8 percent, slightly lower than the record established a quarter earlier. However, the reading still marked a 19.7-percent climb year-over-year. Experian Automotive offered this assessment after the record was set earlier this year. “While longer term loans are growing, they do not necessarily represent an ominous sign for the market," said Melinda Zabritski, Experian’s senior director of automotive finance and a keynote speaker for the SubPrime Forum during Used Car Week. The report from the Used Car Guide referenced above is titled, “Lasting Longer: How Better Quality is Affecting Used Vehicle Demand.” It discusses how new-car quality and durability has increased significantly over the past two decades, and notes how this is having a strong impact on how these cars are bought and sold as used vehicles. Why do you love selling cars? The thrill of the chase. The do-or-die, make-it-or-break-it lifestyle of a salesperson is an exciting way to live. You make more when you sell more. Of course, you make less when you sell less, too, but that’s all in the lifestyle of a salesperson. You love cars. Who better than you to help someone find the right vehicle for themselves or their family? You love people. This was my reason when I was a salesman. And if you were there for any of my Catch and Keep customer strategy presentations this year, you were probably nodding along with me. Either way, if this is your reason, we should talk; we’d get along well! My Catch and Keep customer strategy is all about people because the automotive business is all about people. Yes, technology has changed. Shopping is different, navigation is different, communication is different. But that really amounts to a big change in the people we sell cars to. And I wanted to speak directly to today’s dealers about today’s customers. I wanted to arm all of you with all the insight I can, so you can be successful in a today that’s very different from yesterday. The first pillar of Catch and Keep is that you have to know your customer — this means every car shopper and car owner you interact with. You need to build a modern database that tracks the relevant details about modern customers, and segments them accurately so you can communicate more effectively. That’s what Pillar 2 is all about: right message, right time, right channel. Which brings us to today’s topic, Pillar 3. It’s time to commit. Commitment is a tough term for anyone who knows what today’s customers are like. They buy a car from one person, have their service done somewhere else and switch it up again when it’s time to trade in. Many dealers think they’re lucky to get one sale out of anyone; the idea of repeat business feels a little too lofty. But it really shouldn’t be, if done right. Try to think about businesses that are successful long-term by only living off new customers. There probably aren’t many. Let me tell you about a dealer I work with, Scott Rainville of Apple Automotive Group in York, Pa. Nearly a quarter of his customers, 22 percent, have been customers for a minimum of 18 months. In car terms, that’s a long time! How does Scott do it? How do you keep customers coming back when they always have options, and they always go with the best one? You make sure your dealership is always the best option for every customer. When you know your customer (Pillar 1) well enough to get the right message to them every time, in the right way (Pillar 2), you can absolutely hang in there for the full lifecycle. That means you get the vehicle sale and the add-ons. You get a good customer review that leads to referrals. You get their maintenance throughout ownership, you get the replacement parts business and then, sure enough, you get a good trade-in or at least another vehicle sale. “The lifecycle mindset is something dealers have to mature into,” Scott told me. And he couldn’t be more right. As we all know too well, there’s a lot of pressure to sell every day, so today often feels like the most important day of your career. That feeling is even more intense for dealers who are young in their careers, who haven’t yet gained the perspective it takes to see the value of repeat business. But repeat business is the only way to grow your dealership successfully, so the mindset shift is critical. Scott and his team knew they had a big hurdle to clear with their sales team, so they set up some advanced training on how to use their technology to nurture a more profitable customer and a longer customer lifecycle. Their CRM logs evolving communication preferences, service history … everything that illustrates the experience their customers are having with their vehicles and the likelihood of any upcoming need they might have. And their employees are trained to know their customers well enough to identify additional opportunities beyond the offer that’s currently on the table. Some things they might do, for example, are meet and greet customers in service, understand their customers’ current mileage and vehicle wear and tear, stay up on any of their customers’ lifestyle changes, as well as alert customers to current OEM offers that might be to their advantage. To help build trust, which is crucial in any committed relationship, Apple’s dealers are encouraged to interact with their customers no matter where the customers are or how they prefer to communicate. That means the dealers are trained to create and maintain their own social media identities. On Facebook, Twitter and beyond, they can respond to customer questions and comments quickly, and learn a great deal about what happens with buyers between big purchases. There’s something to be said for a dealer who can talk directly to his customer base while they’re already online, where they make most of their biggest purchase decisions. If you’re available at critical moments, you become memorable, and that’s what you want. You make yourself easy to find and easy to talk to, and you’ll be the easy choice when they’re ready to do business. Here’s an aspect of modern technology that dealers should use to their advantage and often don’t: The Internet makes geography irrelevant. Say you have a solid digital presence — a user-friendly website with strong SEO and complete listings that include great photos. It’s very possible you’ll attract customers from cities and towns you’ve considered outside of your region. You might even sell a car to someone who flew to get to you — someone who did his homework and found the right car for the right price on your lot instead of any of the lots closer to home. Not so fast. Long-distance customers still have long-term potential. When you’re selling with a customer lifecycle mentality, Mr. or Mrs. Out-of-Town Buyer gets classified in your database as an out-of-towner. That means you don’t bother him or her with things like oil change coupons. But you do reach out to him or her with news and updates about the vehicle and anything else that shows you remember and appreciate them and their business. Here’s how this leads to repeat business: Give out-of-towners a good experience, and they’ll tell their social networks. They’ll give you a good review that people can read, again, in any region. They’ll consider buying add-ons from you because they already trust you. And, when it’s time for the next vehicle purchase, they’ll be back. You’ve just landed yourself loyal customers in another state. Plus, you never know who they know or who they’re related to that might just live in your community or around your dealership. Pillar 3 might be my favorite, because frankly it’s where you can really experience a difference in your work and your results — no matter who you are or why you do what you do. The thrill-seekers will have that many more opportunities to chase. The money-minded among us will obviously like how much more money they make in a lifecycle compared to a single sale. If you love cars, or just love selling good things to good people, you’ll have more of that. And it will be more rewarding. If you made it this far without the fear of commitment overcoming you, I have one task for you: Find out what your number is. Figure out how many of your customers have been with you — doing actual business with your dealership in any capacity — for longer than 18 months. Think about what kind of training you need to do with your team to move people into a lifecycle mindset. And then get ready to talk about how to tie it all together and transform your dealership when I’m back right here with Pillar 4! Sean Stapleton is the vice president of sales and marketing for VinSolutions, a Cox Automotive company. Dealers: Are you losing phone leads? It’s possible that dealerships are losing as much as 84 percent or more of their inbound sales calls that are not converted to a deal. That’s according to a recent analysis by IHS Automotive, commissioned by CallSource, which studied the performance of over 540 of the latter’s dealer customers over a year-long period (from April 2014 to March 2015). On top of the high number of missed opportunities, the analysis also revealed that CallSource’s top-performing dealers were able, with proper management, to improve the incoming call-to-sale ratio by over 33 percent. According to ADP Digital Marketing, dealer calls are still outpacing email leads by as much as 4-1, showing that improving in the area of phone handling could possibly work wonders for sales. More information about CallSource can be found here. Read more about Dealers: Are you losing phone leads? Dealer management system provider Autosoft Inc. announced Monday it has expanded its DMS program to offer dealers more choices. The company revealed the release of new APIs (application programming interface) for third-party service software providers to facilitate integrations with its FLEX dealer management system. Company management explained these APIs will allow service software providers to develop real-time bi-directional integrations with Autosoft’s FLEX DMS and further expand their third-partner integration program, FLEX Connect — which currently has over 75 participants. With the release of the new APIs, the company expects to be adding a dozen more partners to the program in the near future, which works to give dealers control over the software providers they select to manage various aspects of their business and make integrations between systems easier. Dealers and automotive software service providers interested in joining the FLEX Connect program can learn more at autosoftdms.com/youchoose. Not only are there more franchised dealerships in the United States than there were at the end of 2014, but the average number of new-vehicle sales per dealership is also trending toward an all-time record. That’s according to statistics from Urban Science, which has released its 2015 midyear Automotive Franchise Activity Report. The data shows that the number of franchised dealerships at the beginning of July showed a 0.3-percent increase from the end of 2014, up to 18,011 rooftops total in the nation. According to the report, the throughput of those dealerships is trending to achieve an all-time record of 945 units per rooftop, resulting in the anticipated 17.1 million new-vehicle unit sales forecasted by LMC Automotive. If achieved, the all-time high would tally the fourth consecutive year that U.S. dealerships maintained a throughput record. While there was a slight increase in the number of rooftops, the number of franchises also increased by 0.3 percent since the end of 2014, up to 31,714 as of the beginning of July. Mitch Phillips, the global director at Urban Science, believes the throughput record is very much likely to be broken this year. “Dealership and franchise counts remain stable throughout the first half of 2015,” Phillips said. “Most local markets have not seen any net change in dealership counts at all. Looking at individual states, Texas has seen the biggest increase of 10 dealerships this year. The Lone Star State is followed by California (8) and Florida (7), then Iowa, Maryland and Virginia (5 each). Identifix announced on Wednesday the enhancements it has made to Direct-Hit, the company’s online automotive service tool. These changes include improvements to the tool’s information database as well as visual improvements, including fully interactive color wiring diagrams. Aiming at being a one-stop tool for vehicle repair professionals, the Direct-Hit tool is now integrated with vintage service and repair data from Chilton, dated back to 1960, allowing access to service manual information and technical service bulletins from Direct-Hit’s diagnostic Hotline Archives or its Vehicle Home Page. According to the company, with Chilton’s coverage of domestic and import models, the tool provides information on 98 percent of all vehicles on the road in the United States today. Direct-Hit is also linked to the International Automotive Technicians Network (iATN), granting access to the latter’s TechHelp community, where technicians post questions on vehicle issues and exchange suggestions and solutions. The tool also now features fully interactive color wiring diagrams, which cover the majority of vehicles manufactured from 1985 to 2015, assisting with the repair of vehicle systems that utilize more and more complex technologies every year. “These new enhancements are much more than simply adding data to our existing online tool,” said Jeanette Dorazio, Identifix’s vice president of product management. “They’re part of our greater mission to provide automotive repair professionals with the tools they need to keep up with the complexity of the vehicles they service, without compromising the efficiency and accuracy that their customers demand. More information about Identifix and its Direct-Hit tool can be found on the company’s website. AutoNation announced its July new-vehicle sales results on Tuesday, highlighting a 9-percent year-over-year increase compared to July 2014. The dealer group retailed 29,875 new vehicles in July. On a same-store basis, new-vehicle unit sales increased by 7 percent year over year compared to July 2014. AutoNation plans to release August sales results on Sept. 2. For more information, visit the AutoNation website. In findings that should catch the attention of used-vehicle departments, too, a monthly analysis developed jointly by J.D. Power and DealerRater showed a majority of new-vehicle buyers in the United States indicate that it should take no more than two hours to complete a vehicle purchase from the time they walk into the dealer showroom. But J.D. Power and DealerRater pointed out in the June 2015 PowerRater Consumer Pulse that industry data pinpoints the median amount of time actually spent completing a new-vehicle transaction is four hours. PowerRater Consumer Pulse derived from an alliance between J.D. Power and DealerRater that integrates each company's capabilities to gather comprehensive vehicle shopper feedback based on J.D. Power’s customer satisfaction research and DealerRater's customer ratings and reviews of dealerships. — More than two-thirds (67 percent) of luxury and 62 percent of mass market buyers indicate it should take no more than two hours to complete a vehicle purchase from the time they enter the showroom. Half of buyers from each segment indicate the ideal duration is somewhere between one and two hours. — Slightly more luxury vehicle buyers than mass market vehicle buyers prefer to spend less than an hour in the dealership (18 percent versus 13 percent, respectively). — According to the J.D. Power 2014 U.S. Sales Satisfaction Index (SSI) Study, buyers who use the Internet to shop for their new vehicle prior to visiting the dealership spend more time overall completing their purchase than those who do not research online. In addition, buyers that used the internet are more than twice as likely to have compared prices from different dealers, and are more likely to know the expected price before they visit the dealer, than those that didn't. "Many retailers are expending enormous amounts of energy and capital to achieve a one-hour transaction time frame for their sales process,” DealerRater chief executive officer Gary Tucker said. “While this quest is noble ― and customers do want to spend less time than they are currently ― buyers tell us that one to two hours is a very reasonable time window," Tucker continued. According to the J.D. Power 2014 SSI Study, most of a vehicle buyer's in-dealership experience is currently spent on selecting a vehicle for purchase and negotiating the deal (60 minutes each, on average). This is followed by an average of 30 minutes to discuss and sign the necessary paperwork and an additional 30 minutes to take delivery of the vehicle. This process leaves the remainder of the overall time spent waiting both before and after the paperwork process, a key area to focus on in terms of creating a more seamless and efficient process flow. "From a generational standpoint, Gen Y buyers spend more time negotiating than other generational groups, as they are more likely than the other generations to conduct research online prior to purchase and to have concerns regarding affordability, which emphasizes the importance of the negotiation phase for Gen Y," said Chris Sutton, vice president of the U.S. automotive retail practice at J.D. Power. “Both Gen Y and Gen X buyers spend less time taking delivery, likely because they need less instruction on the features and functionality of their new vehicles,” Sutton continued. The 2014 SSI Study data found that time spent in the dealership has a significant impact on overall customer satisfaction. While satisfaction among new-vehicle buyers who spend less than two hours in the dealership averages 861 on a 1,000-point scale, satisfaction declines to 844 among those who spend between two and three hours in-dealership and drops to 807 among those spending four to five hours to complete the purchase process. To improve customer satisfaction with the buying process, Sutton suggested that dealers should develop more efficient processes during the different phases of the buying process (vehicle selection, negotiation, paperwork and vehicle delivery). Reducing the amount of time a customer has to wait when purchasing a new vehicle is a key opportunity for dealers, according to the J.D. Power executive. “It’s important for dealers to be efficient with customers’ time,” Sutton said. “Customers will value specific parts of the process, such as finding the right vehicle, understanding features and controls and understanding how much and for what they're paying. “The dealer needs to strike an effective balance between educating the customer and efficiency,” Sutton added. The National Automobile Dealers Association announced today its fierce opposition of an amendment potentially headed for the Senate floor this week that would prohibit the retail sale of used vehicles with an open recall. The NADA as well as the American International Automobile Dealers Association and the National Association of Minority Automobile Dealers sent a joint letter to their senators on Monday to urge them to vote against the proposed amendment. According to the NADA, the amendment in question was officially filed by Sen. Richard Blumenthal (D-Conn.) and may come to the Senate floor for a vote as part of the transportation bill being voted on this Thursday. The organizations speculate that dealers would be less likely to accept trade-in offers due to the knowledge that they would have to sit around until a recall remedy could be found, thus causing many trade-ins to be declined and forcing consumers to sell their vehicles in the private market and further perpetuate the putting off of recall repairs. The organizations estimate that between 250,000 and 500,000 sales of new vehicles would be lost per year due to consumers being unable to trade in their vehicle. 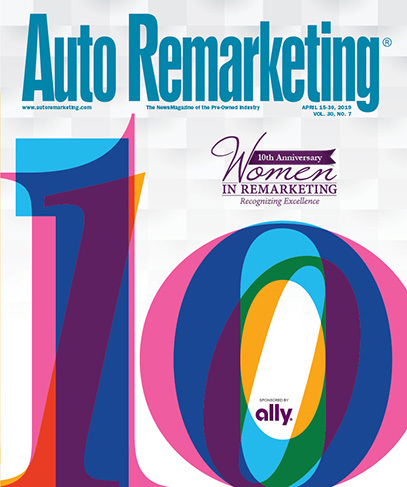 In a previous discussion with Auto Remarketing, vAuto founder Dale Pollak echoed this opinion. “The responsibility of checking and remedying open recalls for all used vehicles prior to sale is an excessive and unreasonable burden to dealers,” Pollak said. “This is because dealers frequently do not possess the resources, expertise and/or parts to make the necessary repairs. Moreover, this situation is exacerbated in light of the fact that dealers cannot practically refuse trade-ins on the purchase of new vehicles. To check out the full letter submitted by NADA, AIADA and NAMAD to their senators, click here. To check out commentary on the topic from NADA Chairman Bill Fox, click here.